Sony recently launched a US variant of its Xperia C4 smartphone via Best Buy. Previously, if you wanted to purchase the handset in the US, you were able to do it only via Amazon, which was (and still is) selling a version without US LTE. Since the Xperia C4 that's available from Best Buy is officially offered by Sony, it's got US LTE, and can be used on AT&T, T-Mobile, and other GSM carriers (sorry, Verizon and Sprint users, this isn't a CDMA device). 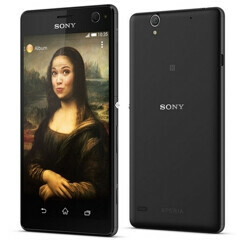 Initially announced in May and presented by Sony as "the world's best selfie phone" (a title which might be disputed once the LG V10 with its dual front-facing camera is released), the Xperia C4 has a 5 MP front-facing camera with a soft LED flash. The handset also features a 13 MP rear camera, a 5.5-inch 1080p display, an octa-core 1.5 GHz MediaTek MTK6752 processor, 2 GB of RAM, and 16 GB of expandable storage space. Made out of materials like aluminum and glass, the Xperia C4 measures 150.3 x 77.4 x 7.9 mm, and includes a 2600 mAh battery. Currently running Android Lollipop, the smartphone will be updated to Android 6.0 Marshmallow. At the moment, Best Buy is selling the Sony Xperia C4 for $279.99 (unlocked), letting you choose between the black and white versions. Any takers? Saw this at Best Buy today. Didn't give it a second thought and moved on to the Moto X Pure display. what about the C5 ultra? Why every dam phone gotta be 5.5 inch tho! Any word on the M5? I picked it up a few days ago and it's a very nice mid range device with a great price point. Picked this up last week. Such a great device!